If you were up late last Wednesday, you’d have gotten the chance to watch the second total lunar eclipse this year. A lunar eclipse occurs when the Earth moves directly between the Moon and the Sun, therefore blocking the light to the Moon and making it turn dark. This is very cool to watch, especially if you get a good look at the Moon during totality, when it is in the darkest part of the Earth’s shadow known as the umbra. At this point, the only sunlight reaching the Moon is that which is refracted through the Earth’s atmosphere. For the same reason as why sunrises and sunsets appear a lovely reddish colour, this light is also quite red, and as the Moon reflects some of this light back at us it appears a dim bronze colour. This is one of my favourite space facts, and I find it quite poetic – you’re looking at the reflected light of all the sunrises and all the sunsets in the world, all at once. There are many spectacular photos of this effect online if you care to search for them too. But this is not what I want to write about in this article. If you were watching Wednesday’s eclipse from Auckland, as I was, you’d probably have been disappointed to see that it was quite cloudy for the duration of totality. However, you were probably able to get a good view of the first part of the eclipse, when the Moon is moving into the outer part of the Earth’s shadow known as the penumbra. As you can see, it looks rather like the Moon is having a bite taken out of it. In this compilation the position of the Moon is held roughly constant but in reality it’s the Moon that is moving here. During a lunar eclipse, we are given the rare opportunity to directly observe the Moon’s orbital motion. Because the Earth is spinning, the Moon always appears to move across the sky from east to west (in the southern hemisphere, this effectively means it is moving right to left). The time it takes to move across the sky varies with the time of year, but it takes roughly 25 hours to do a full circuit. Because of the Earth’s spinning, generally the only way we can usually observe the Moon’s orbital motion is by looking for it at the same time every day. If you do this, then instead of watching it migrate east to west over a day, you’ll see it move slowly from west to east over a couple of weeks. In order to watch the Moon move directly, it would be possible to watch it move relative to a stationary background object. The stars could serve this purpose while the Moon is up at night, although generally it’s bright enough that it’s very difficult to see any nearby stars. The occultation of Saturn earlier this year, which I watched from home through my telescope, gave me a chance to observe its movement against the relatively stationary planet. Like with the stars though, you simply wouldn’t be able to observe this with your naked eye. A solar eclipse is also an opportunity to directly watch the Moon’s orbital motion, as we can compare it to the Sun, as its movement is fairly negligible for everyday purposes when compared with that of the Moon. The problem there, of course, is that you can’t look directly at it without damaging your eyes. 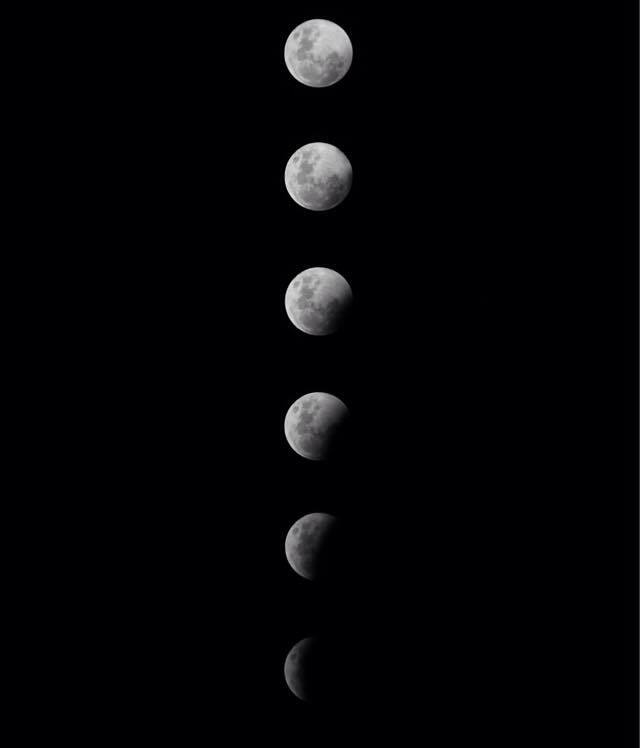 A lunar eclipse gives you the same opportunity except, unlike a solar eclipse, you can watch it directly. If we ignore the Earth’s spin, then both the Sun and the Earth’s shadow (which, of course, must always be directly opposite one another) each take one full year to move the whole way across the sky. Because the 365 1/4 days in a year is very close to the 360 degrees in a circle, we can say that they move roughly 1 degree every 24 hours, or half a degree every 12 hours. This sounds pretty slow, but half a degree is roughly the size of the full Moon so it isn’t entirely negligible. If you want to view this for yourself, the next lunar eclipse visible from New Zealand isn’t too far away. You may have read that there won’t be another total eclipse visible from New Zealand until 2018, but on the 4th of April 2015 there will be a partial solar eclipse in the evening where you’ll be able to see this. In the meantime, have a look up at the sky occasionally and notice where the Moon is (using landmarks as a guide to remember its position will help). If you make it habitual to do this at a specific time (I do it every day when I leave for work, for example) then you’ll be able to watch the Moon’s slow movement backwards across the sky.